Where should I start if I want to get my health in order and live a more productive and energetic life? This in a nutshell is by far the most common question I get when I meet new clients. My first answer to that is always-"get your sleep sorted". Obvious right? Well that is how I start but for me it is a quality start to the day which is key and as far as I'm concerned a good nights sleep is part of a quality morning routine. Waking up refreshed and starting the day right with a good mindset and some movement can be a game changer for most of us. Most of the people I have worked with or just have casual conversations about health with, have not implemented good sleep habits or a quality morning routine. In turn they all have sluggish starts to the day and complain of low energy throughout the day and a general sense of fogginess and low quality work. Hence the reason that coffee exporting is a $20 billion industry. So most people crawl out of bed unrested and throw some coffee on and get on with the day. This is when I ask people if they would be willing to make a few simple changes and spend 30-60 minutes in the morning exchanging poor habits for some good habits all while still enjoying their coffee. Lets pretend its 7am and you wake up feeling rested and recovered from the previous day. What now? Im rested so why use a stimulant like caffeine? This is something I struggled with when I got my sleep sorted and didn't feel the need for any coffee/caffeine. I just would have some coffee because I enjoyed it. This was key for me! Not needing it to feel awake but just enjoying it and in turn getting the subtle effects that the right amount of caffeine in the morning will bring. Caffeine in the correct dose can have many health benefits and can promote neurogenesis in the brain. What is neurogenesis? Neurogenesis is the process of birth of neurons wherein neurons are generated from neural stem cells. Contrary to popular belief, neurogenesis continuously occurs in specific regions in the adult brain. L-Theanine is a relaxing and non dietary amino acid found pretty much exclusively in teas from Camellia Sinensis(along with green tea catechins and caffeine) and is known to promote relaxation without any sedation. What are the positive effects of using L-Theanine? Now the trick with these two is to take them at a 1:2 ratio. This seems to be the magic number for me. I recommend to people that never use any stimulants to start a little lower but for most this is a good number due to most of the research on all the benefits of L-Theanine seem to be at the 200mg mark. 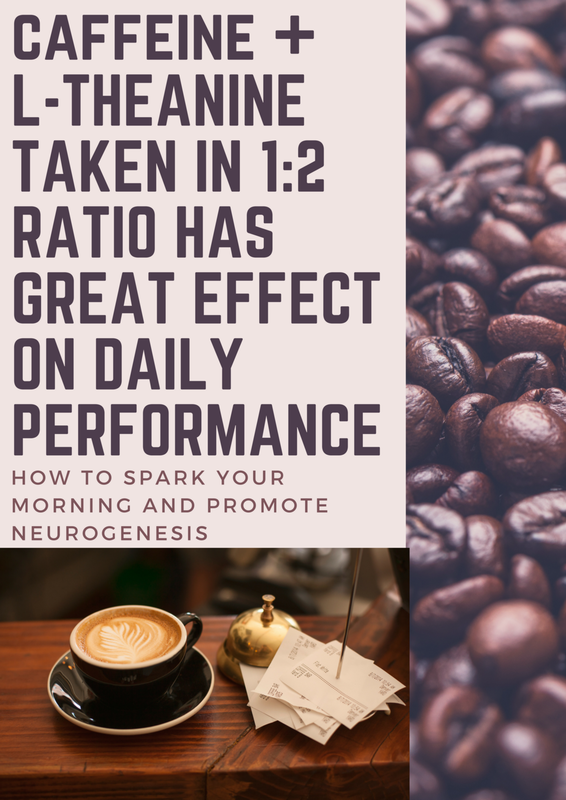 So now we understand that the morning starts with a good nights sleep and that we can use a stimulant like caffeine responsibly for benefit in conjunction with L-Theanine for their synergistic effects. So what else do we add to make the morning complete? Movement and getting your heart rate up in the morning is arguably the best thing you can do to promote neurogenesis and activate BDNF(brain derived neurotrophic factor) in the brain. BDNF is a protein produced inside nerve cells that essentially fertilizes brain cells to keep them functioning and growing, as well as propelling the growth of new neurons. This is why BDNF is referred to as miracle grow for the brain. A book that I reference a lot and recommend all my clients to read is SPARK by John Ratey,MD. The biggest takeaways from the book are based on the benefits of a morning sweat on brain health and cognitive performance and some amazing stories of inner city kids that switched their PE class to first thing in the morning and got their heart rates up nicely before the academics started for the day which in turn saw them make amazing leaps in academic performance just due to the alertness and cognitive priming the morning sweat jumpstarted. My favorite morning sweat is to jump rope. It gets my heart rate up and I like to get creative with tempo and all the different angles and movements. I get to sweat and to spark some creativity while having fun. Just 20 minutes of jumping rope in the morning(5-6 three minute rounds) does wonders and I feel totally rejuvenated when I am done. I also get a lymphatic system cleansing due to the jumping around and all the blood flow through the body from my heart pumping nicely for 20 minutes. This makes for a healthy immune system as well. Its like blowing out all the cobwebs first thing in the morning by getting all that blood flow and oxygen to the brain which in turn boosts the effects of the caffeine and L-Theanine you took pryor to the sweat. Its a WIN WIN! When I finish this quick morning routine I get a nice 5 minute cold shower in and eat a nutrient dense meal. This is the icing on the cake and I feel amazing! The benefits of the cold exposure is a whole other post in itself so for now I recommend trying this morning routine. You don't need to jump rope, it can be anything that gets your heart rate up for 20 minutes in a more aerobic fashion. Studies show that aerobic style exercise in the morning is what mainly activated BDNF and in turn promotes neurogenesis. This isn't a replacement for your strength training or fitness routine. This is to get you a jumpstart on your day. I still recommend everyone strength train a few days a week. You can find a cheap supplement that has the proper 1:2 ration of caffeine to L-Theanine all over Amazon. I recommend the supplement so you get the dose and ratio correct. It is not possible to know how much you are getting from coffee, tea, etc. Last thing is that I recommend you use this supplement stack 5 days on and 2 days off to not build a tolerance and feel the need to up the dose. I hope anyone that reads this will give this routine a try for a week and see how much better you feel during the day. Give this routine a couple months and you will be forever changed.